Annie’s Boutique is a specialty store located within the House of Clocks. We have a well trained sales team offering our customers a level of attention and service that motivates them to return time and again. Our store has a constant flow of well selected, fairly priced merchandise, and we are constantly buying new trends and styles. Our philosophy is fashion is what makes our customer feel pretty. Accessories are a vital part of a woman’s wardrobe. They do not just complete the outfit, but more importantly highlight the personality of the wearer. Jewels, fringe, applique, tassels, design hardware, patches and patterns add visual interest to the oufit. We have a handmade collection of jewelry made from silverware. Rings, watches, bracelets and necklaces are all made from vintage silverware pieces. Sterling silver necklaces, earrings and bracelets come in inspirational styles as well as interesting designs for nature lovers. We also have message necklaces attached to greeting cards that make nice gifts. Satin silver and mixed metal necklaces add a nice accent to any outfit. Our bracelet selection includes metal, decorative stone, beaded and cuff style. We carry a wide variety of watches and watch bands. We also replace watch batteries. Our handbag selection contains a wide variety of styles and colors. We carry clutches, messenger bags, crossbodies and wallets. The larger handbag collection includes buckets, envelopes, frame and saddle bags, top handles, sohos, tassels and satchels. Bag accents include studded, fringed, zippered, suede and metal hardware. Our scarf collection varies widely in styles, colors and fabrics. We have scarf charms to add visual interest to the scarves. 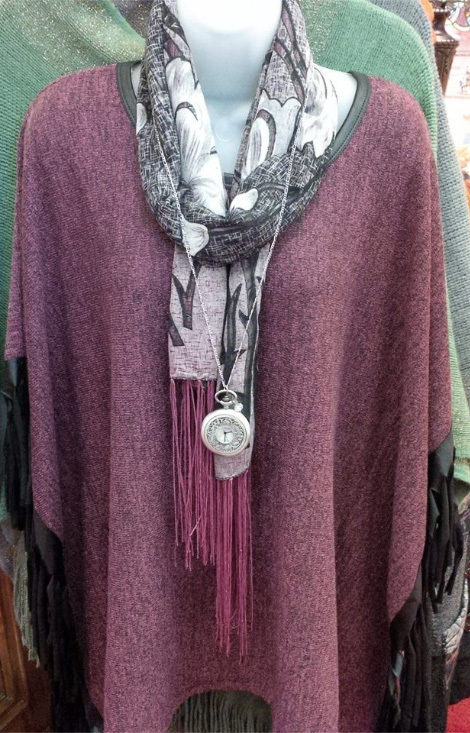 Our staff can help our customers coordinate scarves to complete outfits. We also have an assortment of hats, boot socks, gloves and mittens. We have clothes for every occasion from casual to dressy. Jackets, cardigans, sweaters and vests can complete any outfit. Fabrics include suede, brocade, embroidered, seersucker, denim and linen. Cascade cardigans, asymmetrical designs and tunic tops flatter all body types. Pants, leggings and layering tanks add to the stylish outfits we have on display. Current fashion trends we have on display are tops with peek-a-boo shoulders, ladder and bunched detail sleeves. Florals and botanicals are very popular and are available in several colors and styles. From pastels to vibrant colors we have something for everyone. Our staff is eager to help you find the perfect outfit for yourself or gift certificates for your friends or family.